I just started this blog devoted to c-sections and so I find myself “listening” in on all sorts of childbirth-related conversations on various blogs…like this essay by Modern Mom blogger Jill Simonian where she writes about being “excited” for her upcoming c-section. Today I was on Modern Mom again and and when I scrolled down to read the comments about Jill’s essay, I was so irritated by some of the mean-spirited, judgmental, and inaccurate attacks on Jill that I feel like I have to come to her defense (and I don’t know her). A bunch of women who wrote in criticized her for putting a positive a spin on her c-section experience — which is, after all, her experience. One writer had me practically hyperventilating. I know that there are lots of people who like to write in — anonymously, of course — and spout their opinions and judgments about all sorts of issues. And I know that these comments are better left ignored. But why do all these strangers feel like it’s their right to spew? Reading the comments gave me flashbacks to my first c-section. I remember feeling like I had to justify it for months. And my son’s delivery was an emergency to the ultimate degree. Looking back on the experience, I’m only annoyed that I wasted even one second being bothered by comments of people whom I barely knew. Whether a woman has an epidural or delivers her babies without pain relief….whether she has an elective repeat c-section or a VBAC….whether she feeds her babies from the breast or bottle, or does some combination of all of the above, it’s her business. Aren’t we all just doing the best we can in whatever circumstances we’re in? Can’t we all just lighten up? Did you ever feel like your friends or family members were critical of the decisions you made about your baby’s birth? What was the worst thing anyone ever said to you? There were all sorts of rumors about the birth of Jay-Z and Beyonce’s baby’s birth last month — like, did you hear the one about how Blue Ivy was actually born via surrogate? And that Beyonce wore a fake bump for most of 2011? (One look at Beyonce in this red dress mere weeks after Blue Ivy’s birth should have put those rumors to rest: those are the breasts of a new mom!) How about the rumor that Beyonce scheduled a c-section for the sake of convenience? She dismissed this one a statement to US Weekly. In the United States there are some physicians who will do c-sections for the sake of convenience, but it’s pretty rare. For one thing, insurance companies frown on the practice in part because the extended hospital stay makes it so much more expensive. I’m sure insurance coverage isn’t an issue for the celebs who schedule their baby’s births, but I just can’t imagine volunteering for surgery — even if I had the Grammy or Academy Awards on my calendar! What do you think? Should c-sections that are not medically necessary be covered by insurance? Should the mode of delivery be a woman’s choice rather than her doctor’s? Most women I know who have had a c-section — or two or three — have at least a few regrets about their babies’ births.The common theme is that the c-section was unplanned (as most are) and so none of the plans they had made for their “natural,” i.e. drug free and/or vaginal, birth, happened the way they envisioned. My writing partner just sent me this video that we both wish we had seen before our c-sections (we’ve had 6 between us). One thing that caught my attention was that after the baby is delivered, the doctor places the baby right on the mom’s chest so they both can take advantage of the skin-to-skin contact that so much research shows is really important for bonding and breastfeeding success. 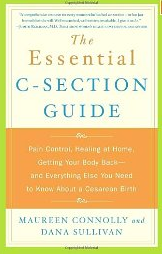 With this “natural” approach to c-section, the parents get to watch the birth of their child as active participants. The physician also delivers the baby more slowly than is typical and squeezes the baby’s chest (which may help reduce risk of later breathing problems that I wrote about previously). Be warned: this video shows some pretty intense surgical shots, but it’s AMAZING. Was your c-section anything like this? If you’re planning to have more babies, would you ask your doctor to do anything you see in this video?